The thing I love about pasta is that its so versatile. There are endless possibilities when it comes to pasta and what you can do with it. This is something that I was grateful for last night when I came to make my tomato, basil and brie pasta, and found that I did not in fact have any brie. But as is always something that can be found to put on pasta, even in the most meagre of fridge-contents, all was not lost. There were cherry tomatoes and basil in the fridge, a good foundation for any pasta sauce. 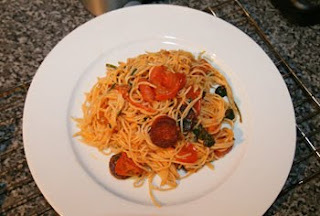 There was also chorizo, spinach and parmesan. A bit of fire, a bit of sweet tomato, a bit of veg, perfect! 🙂 So dinner ended up as an improvised pasta sauce containing all of the above, and it wasn’t bad at all. 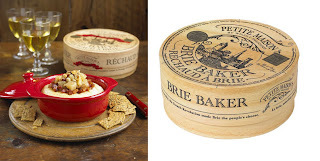 One of the Valentine’s Day gifts that I gave Jel was a Brie Baker. This is a little kitchen tool that I discovered when looking for a Christmas present for a friend last year, and it is a gem. Jel and I are both big cheese lovers and this miniature casserole dish which is the perfect size to fit a round of Brie or Camembert, is a cheese-lover’s dream. We tried it out for the first time last night and all I can say is YUM! We baked a round of camembert with a splash of white wine and a clove of garlic, and it was liquid, creamy heaven. We dipped Moroccan-style herb and poppy-seed crackers in the cheese at it made a sublime, decadent starter. Although I may have to do a double length run tonight to work it off, it was undoubtably worth it.